We experienced a great week with more than 30 fish landed and many more lost. Considering we only had a small number of rods fishing this past week, , we caught a good number of fish, including some really nice ones! Daniel with one of his fishes this week – this one from E2 – fresh and sealiced! The few fishermen this week hit it perfectly. The water dropped in the beginning of the week to under 50 m³ at the Gaulfossen gauge and caused the salmon to stop and hold in many of our pools and it was possible to catch them at some of the beats we haven’t fished much this season. Regular guest Andreas Witt caught a nice fish on Beat BS1 around 5,5kg, 4 grils between 2 and 3 kg, and lost a couple of more fish. Also regular Italian guest Stefano Mantegazza had a fantastic week with 8 fish landed! Most of them on the E-beats which always fishing well when the water gets low. Stefano with a grilse from Beat E3 – they are fun catching on small rods! 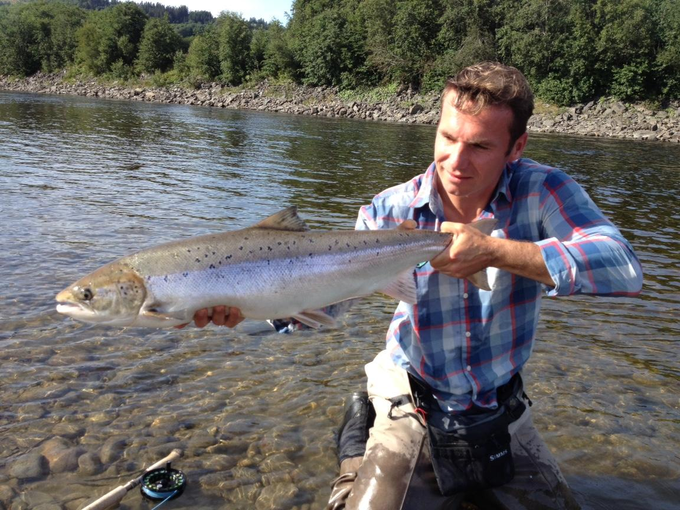 Stefano also had nice fish with a 6,5 and 4 kg and several more grilse around 3 and 3,5kg. Most fishermen have been fishing on their own, as there were many open beats and they could move around, sadly that is also the reason we haven’t got many pictures. NFC’s Daniel had superb week next to his work and landed a total of 11 fish in total from Sunday to Friday! 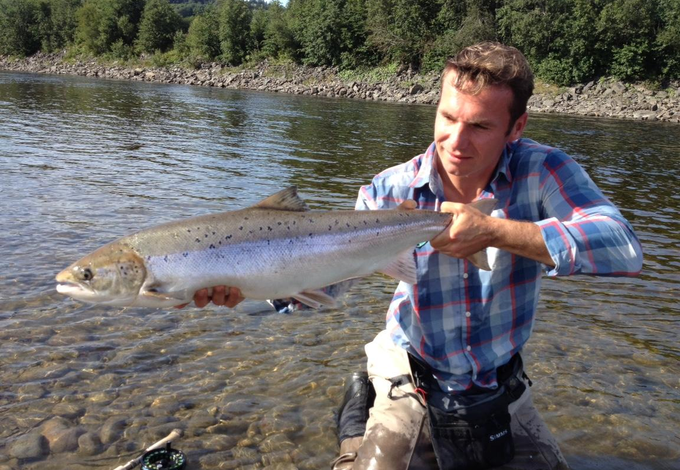 The fish he caught were decent in size: 10kg, 7,5kg, 7kg, 7kg, 4kg and a couple of grilse! 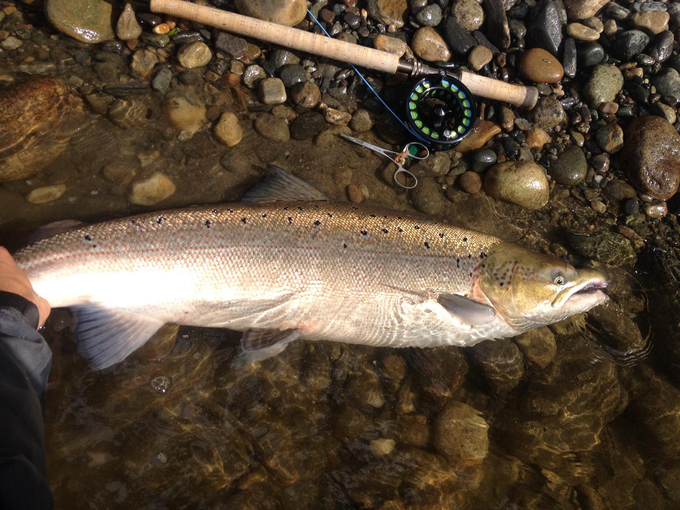 A big male of 100cm lengths, approx 10kg – caught by Daniel on Beat D2. Another good fish about 7,5kg on Beat C2 which Daniel could catch and release this week. Daniel’s big fish was not the only big fish landed this week –Thies Reimers also had a fantastic fish of 101cm in length and about 10kg, bright and silver just below our Lodge! Thies landed 3 more salmon this week. 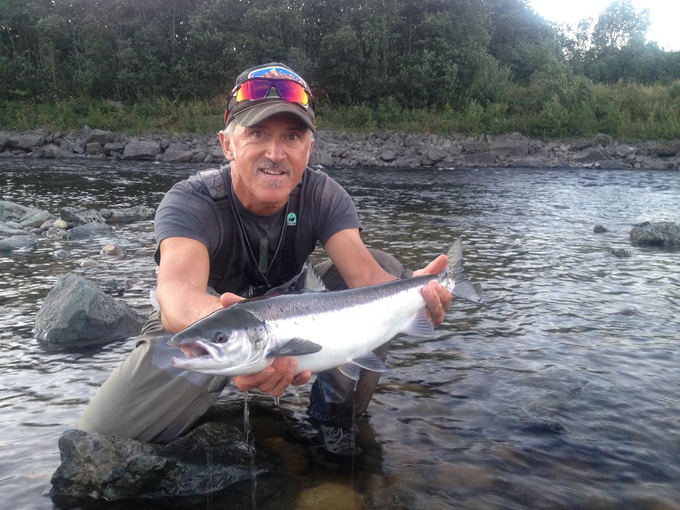 Friedrich Wagenhals also landed his first salmon ever, a nice grilse and Michael Schuhmacher was able to catch his first two salmon, the first a nice fish of 5kg on beat BS1 and another grilse on the E-beats. 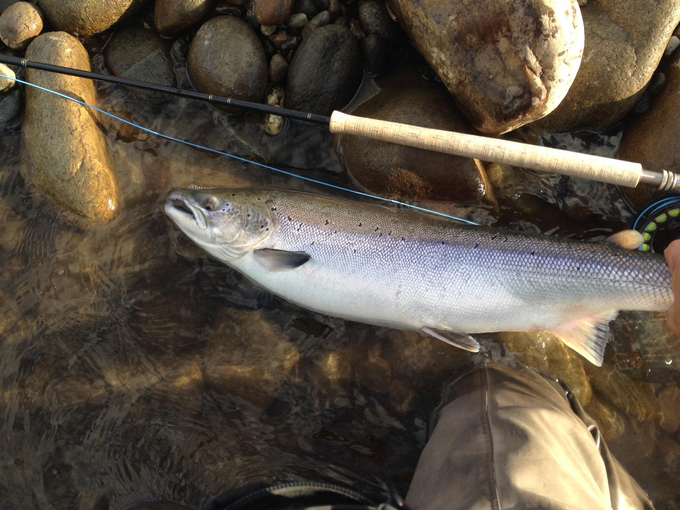 It is nice to see lots of fresh fish running the river late in the season. This means the run has been quite constant throughout the season, which will most likely effect in a good spawning year and give us good hopes for the coming years and salmon runs on the Gaula! The water keeps dropping at the moment due to the warm weather, but some rain is forecasted on the long term, so we are looking forward to the last two weeks of the season – who knows how this season will end up – already now we can say it has been a very good one on the NFC beats.